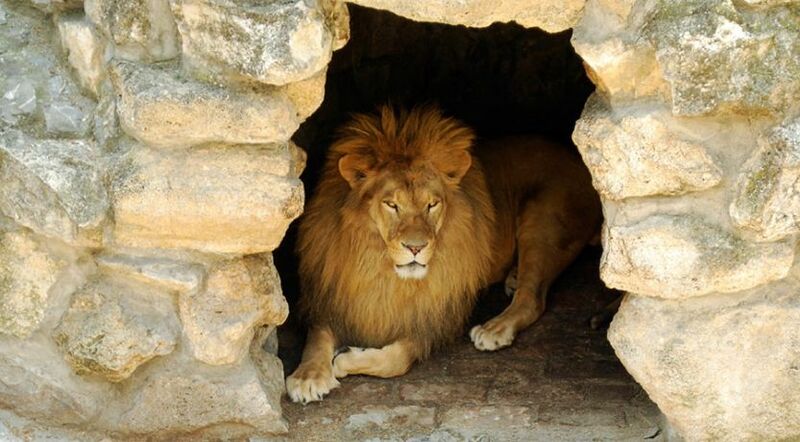 The famous Bible story of Daniel and the lions’ den is more than a simple account of God’s deliverance. It also shows that no one is a match for the true God. The king’s obvious anguish was in stark contrast to the barely hidden glee of his trusted officials. Upon the advice of these men, King Darius had rashly issued a decree forbidding anyone from making petitions to “any god or man for thirty days” (Daniel 6:6-9) except him. The penalty for disobedience was to be a horrifying death in a den of ravenous lions! And now Daniel, his most gifted officer, had been charged with flagrantly violating this irrevocable law. Reading through the sixth chapter of Daniel leaves Bible students with a vivid picture of an impetuous king manipulated by advisers to destroy a man of God. As we progress through the story, we first see the envy of the king’s advisers, then the folly of the king, followed by the peril to Daniel and the anguish of the king. Finally, we see God’s deliverance of Daniel and His judgment on Daniel’s adversaries. Most people in the Western world have a passing familiarity with this story, a perennial favorite in collections of Bible stories taught to children. However, most people don’t fully grasp the meaning of this confrontation between one of God’s beloved servants (Daniel 9:23) and his enemies. The first step in understanding the story is to come to appreciate the historical and cultural context of the conflict. Daniel and many of his fellow Jews were no longer living in the Promised Land, but in Babylon. The Babylonian Empire had crushed all its enemies, including the Egyptian Pharaoh Neco II at Carchemish in 605 B.C. This critical battle opened the door to Babylonian dominance over Judah. Daniel, probably as a teenager, was among the first residents of Jerusalem to be deported to Babylon. Living in the Promised Land had been an essential element of the covenant between the children of Israel and their God. The land itself was more than a home, more than a gift from God. It was a symbol of His power and authority. When Babylon took the Jews into captivity, some of them may well have been in shock that their God had not prevailed. The God who parted the waters of the Red Sea, using those same waters to drown the pride of Egyptian power, had not delivered Jerusalem from Nebuchadnezzar’s armies! How could that be? Of course, Israel’s and Judah’s prophets had warned that God would withdraw His protection from His people if they continued to ignore His laws. As far back in their history as Moses, the warning had been in front of the nation (Deuteronomy 28). Yet the children of Israel stubbornly persisted in their sins. The people of Judah went into captivity not because God was powerless before the armies of Babylon, but because of their sins. The questions of exile are a fundamental part of the book of Daniel, as noted by Gleason Archer (The Expositor’s Bible Commentary, 1985, Vol. 7, p. 4): “Indeed, it was essential for him [God] to prove by his miraculous acts that he had allowed his people to go into captivity in 587 B.C., not through weakness, but rather to maintain his integrity as a holy God, who carries out his covenant promises both for good and for ill according to the response of his people. So the whole narrative in Daniel relates a series of contests between false gods of human invention and the one true sovereign Lord and Creator of heaven and earth” (emphasis added). God is holy and righteous, and He will not be mocked (Galatians 6:7). He does not permit ongoing sinfulness to continue forever. Eventually, rebellion against God brings consequences. But even for those Jews who understood, exile brought with it questions. How could they serve God without a temple? How could they be the covenant people while separated from the Promised Land? The book of Daniel reveals the answers through the positive examples of Daniel and his companions, Shadrach, Meshach and Abed-Nego. Through a series of trials of their faith, they remained loyal to the true God. We see the first challenge in the first chapter. Daniel and his friends refused to eat and drink anything that would defile them (Daniel 1:8, 11-12). The foods they were initially given to eat may have been unclean or filled with fat, making them unfit for someone who obeys God’s laws (Leviticus 11; Deuteronomy 14; Leviticus 7:23). Daniel and his friends prevailed through the favor of God. Other challenges that followed include the interpretation of dreams (chapters 2 and 4), the golden image and fiery furnace (chapter 3) and the handwriting on the wall (chapter 5). Daniel had already served with distinction in the administrations of the Babylonian kings Nebuchadnezzar (chapters 1-4) and Belshazzar (chapter 5) when the Medo-Persian Empire conquered Babylon. In chapter 6, Daniel now starts serving King Darius, a leader some historians believe had previously served as one of the generals of Cyrus, the Persian emperor. As a viceroy for Cyrus, Darius enlisted the help of Babylonian nobles to govern the conquered territory. Cyrus was renowned for creating an empire that drew on the talents of subjugated people. Satraps, or governors, ruled over provinces with a great deal of autonomy in this remarkable system. At this point in his life (539 B.C. ), Daniel was a prominent elder statesman close to 80 years old. Darius called upon him to be one of three governors over the satraps. Because of Daniel’s skill and integrity, though, Darius decided to promote him to a position above the other governors (Daniel 6:3). It may have been this plan that set in motion the events of chapter 6. Envy was undoubtedly a major motivation for the plot to disgrace or destroy Daniel, but it is just as likely that Daniel’s honesty prevented these men from illicit revenue through bribery, fraud and misappropriation of funds. To Daniel’s credit, his enemies could find no fault that would discredit him. They had observed, however, Daniel’s unswerving dedication to God. They schemed to manipulate circumstances such that Daniel’s dedication would appear to be disloyalty to the king. These governors and counselors then approached Darius (verse 6). Significantly, this chapter sets up a test of faith based on prayer itself. We must have faith to believe that God hears our prayers and that He answers us (Hebrews 11:1, 6). In Daniel’s case, though, the very act of kneeling before God was a test of his faith. This focus on wording may seem like a small point, but understanding the atmosphere in the royal court helps to explain the king’s rash decision. These men did not merely petition the king as calm government officials. They presented an aura of urgency through emotion, perhaps suggesting the possibility of disloyalty among the newly conquered people of Babylon. What could make more sense than a test of loyalty to the king crafted as a ban on petitions to any other man or god? Significantly, this chapter sets up a test of faith based on prayer itself. We must have faith to believe that God hears our prayers and that He answers us (Hebrews 11:1, 6). In Daniel’s case, though, the very act of kneeling before God was a test of his faith. Verse 10 of Daniel 6 tells us that, “when Daniel knew that the writing was signed,” he knelt and prayed as he always had. Daniel knew the type of men who shared governmental authority with him. He knew they would be watching. He knew they had set a trap. But Daniel also knew the God he served! This verse also points out another important aspect of Daniel’s prayer—he faced Jerusalem. Praying toward the temple in Jerusalem had long been customary among the people of God (Psalm 5:7), but Daniel may have had more in mind. Although he was a captive in exile in Babylon, he was undoubtedly quite familiar with Solomon’s prayer at the dedication of the temple four centuries earlier. Solomon had anticipated a time when God’s people might be carried away captive, so he specifically asked that God look with mercy on them when they repented, praying toward the temple (1 Kings 8:46-53). God later appeared to Solomon, telling him that He had heard his prayer (1 Kings 9:3). The crucial act of faith in chapter 6, however, is prayer. Daniel prays toward Jerusalem, a city leveled by the Babylonians, and he prays toward a temple that no longer stands. Daniel’s actions clearly show that it was not the Promised Land, nor was it the city of Jerusalem, nor even the existence of a temple of God that was vital to the faith of Israel. His prayer demonstrates that what really matters is wholehearted dedication to God Himself. That is the core of real faith, and a fitting response to enemies who defy the true God and persecute His people! One of the most important elements of the story is the law of the Medes and Persians. Three times in the chapter we read that this law, once issued, could not be changed (verses 8, 12, 15). Even the king was powerless to change his own laws. What we read in chapter 6 is different from the preceding five chapters. Nebuchadnezzar and Belshazzar were Babylonian kings, not Persian. As such, they were free from such constraints. This provision may seem strange to modern readers, but there were valid and practical reasons for the Medes and Persians to adopt such an attitude toward law. First, the inability to change a law after issuing it would impel the king to be more deliberate in considering legislation before enacting it. Second, the legal framework of society would be more stable. Perhaps the reason that is most relevant to Daniel 6, though, is one that has more to do with manipulation of laws to achieve one’s purpose than stable government. Daniel’s enemies used this established concept of Persian law to entrap Daniel and outmaneuver the king, who was actually fond of Daniel and wanted to save him (Daniel 6:14-15). Even though the king was compelled to have Daniel thrown into the lions’ den, God miraculously spared Daniel’s life. As Daniel told the king the next morning, “My God sent His angel and shut the lions’ mouths, so that they have not hurt me” (verse 22). Daniel’s enemies did not prevail against this servant of God. We should also note that only the true God has unchangeable laws, purposes and promises: “So shall My word be that goes forth from My mouth; it shall not return to Me void, but it shall accomplish what I please, and it shall prosper in the thing for which I sent it” (Isaiah 55:11).